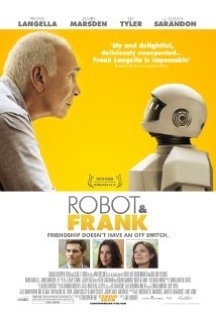 Review: “Robot & Frank” is a futuristic comedy depicting an unlikely association between a man and a robot to perpetrate some criminal actions. Frank lives alone and is having problems with his memory. So, his son offers him a robot to help cleaning the house and make healthy food. Frank gets mad in the beginning but then has the brilliant idea to use the robot on what he does best: burglary. Frank Langella has a compelling performance as a compulsive thief, but Shreier’s first film has its flaws. Why Frank wasn’t arrested right away when it got proved that he had broke into the library to steal a precious book? The film’s development was time-consuming and not particularly funny, with the story starting to get a bit warmer after an hour. I cannot say this is a bad movie; its story is just not thorough enough to be remembered in its genre. Still, this robotic-crime-comedy should please those who have a taste for low-key crime films with a hint of futurism.